VSHosting Review 2019: Is VSHosting a Good Hosting? VSHosting has dominated the hosting business in the Czech Republic and Slovakia for more than ten years. Big businesses across Europe can benefit from this company’s experience of managing big internet projects for big corporations with complex websites. 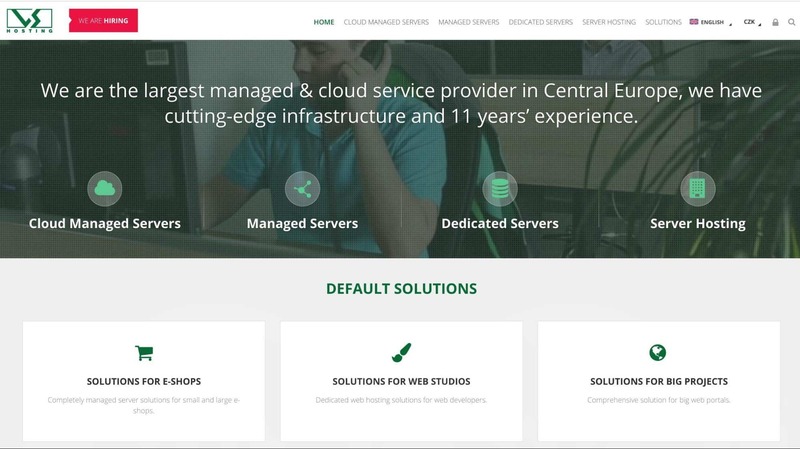 VSHosting has been in operation since 2006, marketing themselves as the largest provider of cloud and managed hosting services in the Czech Republic and Slovakia. With data centers in the Czech Republic and the United States, their global hosting infrastructure of 8,000 servers gives them the capacity to host websites of any size and complexity. Thousands of corporate clients surely can’t be wrong. VSHosting offers both managed and unmanaged dedicated servers, with the managed services options being perfect for organizations lacking the technical expertise to undertake big internet projects. Their managed server solutions include in-depth technical support, management of client hosting hardware, and monitoring of data centers. The cloud managed servers option includes Linux operating system administration and frequent server load checks. Big businesses in the Czech Republic and other countries across Europe can benefit from this vendor’s established operations and incredible experience managing big internet projects for big corporations with complex websites including e-commerce shops, gaming websites, payment systems, web studios, and large internet portals. In the unlikely event of a disaster, the data center servers support total autonomous operation. To best serve a pan-European client base, the VSHosting website is available in Czech, Polish, and English. The prices for their hosting plans are a little higher than the industry average, reflecting VSHosting’s experience-based confidence in their ability to provide quality hosting solutions. As to be expected, managed server solutions cost more than unmanaged services. Customers can contact the support team via telephone, email, the contact form on their website, and social media. Calls are typically returned almost immediately, and on one occasion my email message was answered in less than 20 minutes. Despite this enviable email response time, I do have some slight doubts about the scarcity of information in the company’s knowledge base and the apparent absence of any uptime guarantee, so those are two points to check when communicating with the company. VSHosting has the expertise and experience to offer quality hosting solutions to businesses of any size. The vendor could provide additional assurance to potential customers by being more transparent about any uptime guarantees. Wondering how VSHosting stacks up against other Web Hosting companies? Enter any other Web Hosting company and we will give you a side-by-side comparison.